This is WOW News 247: Niger Delta Militant Attacks: Nigerian Government Suspects Foreign Conspiracy? 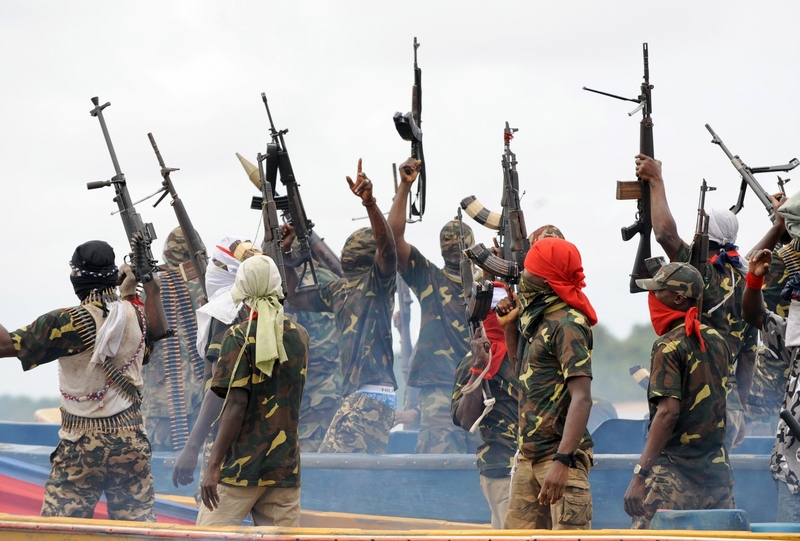 Niger Delta Militant Attacks: Nigerian Government Suspects Foreign Conspiracy? The Federal Government has begun an investigation into the possibility that some foreign nations may be backing the militant activities in the oil-rich Niger Delta. New Telegraph gathered from highly placed military sources that the intelligence arm of the military and other security agencies were already looking into the source of supply of the sophisticated arms at the disposal of the agitators. One of the sources, who spoke in confidence, said the need for a comprehensive probe had become urgent, in view of the fact that a large cache of arms had been surrendered to the state, in the wake of the Amnesty Programme. It was further gathered that the latest threat by the Joint Revolutionary Council (JRC) – a group which claims to be the highest organ of all the agitating groups in the Niger Delta – to launch six missiles in the area tomorrow raised more concern within security and military circles. The source, however, dispelled rumour of a fullblown military operation in the Niger Delta, saying the military was mindful of the compelling need to protect innocent people in the area, who must be protected. According to him, the new strategies being mapped-out, will not exclude the protection of human rights, as well as the rule of engagement (ROE), which he said is central to all military operations. “There are international machineries that have been employed for the sole aim of destabilising the nation, in order to control our oil. “When you hear these guys say they are launching missiles, it is from the support of their international conspirators. The senior military source stated: “We must get whoever is behind this renewed acts of vandalism, which have cut production by about 800,000 barrels per day (bpd). “Whichever way you look at it, yes, there could be the possibility that they (agitators) have international collaborators. “All over the world, there is nowhere in history that non-state actors ever succeeded over state actors; ours will not be an exception. “The Nigerian Armed Forces will ensure the indivisibility of this great country of ours.” It will be recalled that the JRC had, in a statement issued last Thursday, given the Federal Government a 48-hour ultimatum to withdraw the military from the region, or be prepared for a full-blown war. “All oil and gas operations should shut down immediately as our missiles testing will affect their equipment. “Note, we shall commence missile testing on Tuesday, June 7, which coincides with the date of our training abroad,” the statement read. The Niger Delta Avengers (NDA) had launched series of attacks on oil and gas installations in Bayelsa and Delta states. Meanwhile, palpable fear has gripped the troubled riverine communities in Delta State even as military personnel are gradually withdrawing from the area. Investigation revealed that the panic stricken villagers, who had deserted their respective communities in the wake of the onslaught, are still afraid to return home despite the gradual disengagement of the military. The communities affected are Oporoza, Kurutie, Okerenkeko, Gbaramatu and other neighbouring villages and environs. New Telegraph, however, gathered that life is becoming unbearable for those individuals who were still trapped in the communities, as well as those who ran to the bush for safety. Up till yesterday afternoon, there were sporadic shooting both from the military and the militants who engaged themselves in open confrontation. Subsequently, the panic stricken residents who were trapped in their houses have appealed to President Muhammadu Buhari and Governor Ifeanyi Okowa to come to their aid. But scores of persons who are now residing in various camps in Warri and Sapele have called on Buhari to assist them with shelter and compensation.